Luxury vinyl flooring is a beautiful flooring option that is durable and tough to withstand all that you can throw at it. This is one of the biggest advantages and reasons people get luxury vinyl. A simple cleaning routine will help to keep your luxury vinyl looking great for a long time. 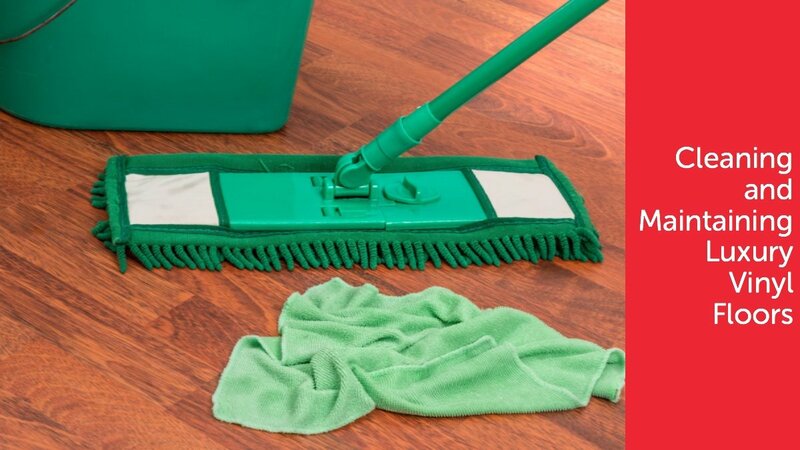 Routine sweeping and mopping will help to keep your floors free of any grime and buildup that might end up on your floors. Heavy traffic areas may need to be cleaned once a week, whereas lower traffic areas may need cleaning every two weeks. Use a gentle, nonabrasive cleaner to prevent scratches. If you vacuum instead of sweep, make sure the beater bar is turned off to avoid any potential damage. The biggest thing to worry about with luxury vinyl is staining. You can help to prevent stains by cleaning up any spills immediately. Manufacturers also have instructions on their websites to remove stains from your luxury vinyl. Steam cleaners are not recommended because the high temperatures can lead to wrinkles and problems with the adhesive. Doormats will also help to trap dirt and grime, keeping it out of your house and off your floors. This dirt and grime can wear out your floor quickly, making it look grungy and old. Even worse, when the top layer of your flooring gets worn down it can become more susceptible to stains. Like hardwood, furniture can also damage your flooring, so try not to drag your furniture across the floor. Instead, try lifting and moving. This will help to prevent any potential damage. Furniture pads will also help to prevent scratches. Luxury vinyl is simple and easy to take care of. Following these simple care tips will help to protect your floors and keep them looking beautiful.